The auld Toun Haw on the squerr in Randers wi a statue o Niels Ebbesen in front. 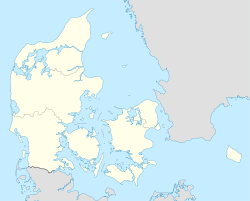 Randers (Dens pronunciation: [ˈʁɑnɐs]) is a ceety in Randers Municipality, Central Denmark Region) on the Jutland peninsula. This page wis last eeditit on 11 Mairch 2018, at 15:42.